Yay! 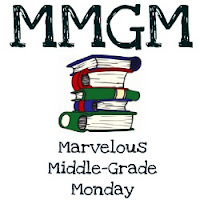 I’m back to Marvelous Middle Grade Monday! Well, for this week anyway. I’ve been on a bit of a young adult kick lately since that’s what I’m writing at the moment. However, I managed to squeeze in a middle grade read last week, and it’s definitely worthy of a review. 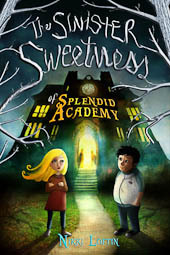 So here’s THE SINISTER SWEETNESS OF SPLENDID ACADEMY by Nikki Loftin. When Lorelei’s old school mysteriously burns down, a new one appears practically overnight: Splendid Academy. Golden bowls of candy in every desk? Mouth-watering cafeteria meals, served by waiters? Optional homework and two recess periods a day? This place is every kid’s dream! But Lorelei and her new friend Andrew begin to suspect that their teacher, the hypnotic Ms. Morrigan, is not who she seems. The mountains of syrupy pancakes and heaps of marzipan leave a sickening taste in their mouths as they uncover a sinister mystery at the heart of their classroom. What Lorelei and Andrew soon discover chills their bones, and might even pick them clean! 1. The cover and title – I’m grouping these together because they’re both about my first impression. I love the alliteration in the title, and it’s absolutely perfect for the story. So is the illustration on the cover. The three shadows peeking out the door. The trees looping into the words. Lorelei and Andrew. Just perfect. 3. The allusions to eating – I don’t think I’m spoiling anything since the tagline says, “Were we being fed? Or fattened up?” It’s pretty clear what’s going on at this school, so it’s fun to read into the things teachers say that wouldn’t normally have another meaning but become quite ominous when you suspect they plan to eat you. There are many of these in the book, and they’re cleverly done. 4. The mystery – There are many threads woven into this story, and while the main mystery isn’t much of one, there are others being slowly unveiled in the background. What happened to Lorelei’s mother? Is Principal Trapp in on it? It kept me engaged, wondering how it would all come together in the end, and it wasn’t exactly what I expected. I love it when that happens! 5. The underlying messages – I like it when a book is able to convey important messages without hitting you over the head. Nikki Loftin does this well. Lorelei and Andrew both have issues they struggle with. Andrew’s weakness for food is what tips him off about what’s happening at the school, and his explanation to Lorelei could possibly help kids with the same issue. I don’t want to give away Lorelei’s main struggle since it factors into the climax, but it’s an excellent message as well. I’ll definitely pick up Ms. Loftin’s next book when it comes out. Has anyone else read this one? What did you think? When seventh grader Georges (the s is silent) moves into a Brooklyn apartment building, he meets Safer, a twelve-year-old coffee-drinking loner and self-appointed spy. Georges becomes Safer’s first spy recruit. His assignment? Tracking the mysterious Mr. X, who lives in the apartment upstairs. But as Safer becomes more demanding, Georges starts to wonder: how far is too far to go for your only friend? 1. Sir Ott – I love how a painting by Seurat is so woven into the story it becomes both a character and a metaphor for what’s happening in Georges’ life. He’s even named after the artist–Georges Seurat. There are multiple passages I could choose to demonstrate, but I’ll go with the introduction of the painting. “What you can’t tell from our poster is that the picture is painted entirely with dots. Tiny little dots. Close up, they just look like blobs of paint. But if you stand back, you see that they make this whole nice park scene, with people walking around in old-fashioned clothes. There’s even a monkey on a leash. Mom says that our Seurat poster reminds her to look at the big picture. Like when it hurts to think about selling the house, she tells herself how that bad feeling is just one dot in the giant Seurat painting of our lives. 2. The friendships – Georges navigates through multiple friendships in the book–his former best friend, Jason; his new neighbor, Safer; and the kids at school, including Bob English Who Draws. He learns something from each of these friends–something about himself and something about friendship. I really love how these storylines developed. 3. The mystery – This was so well-done. There’s a mystery set out by Safer that masks another undercurrent running through the entire story. I was always aware something else was going on in the background, but I couldn’t quite put my finger on what it was until I got to the end. I won’t spoil it for anyone by dropping any hints. 4. The parents – I really loved the picture Rebecca Stead drew of Georges’ parents. I could see them so clearly, even when they weren’t in the scene. The Scrabble conversation Georges has with his mom is so poignant. And their financial difficulties were handled in a way that the reader gets it without it becoming the main focus of the story. I always appreciate it when there’s a good family relationship. 5. The theme – There’s an overriding theme of figuring out how to face your fears. It’s carried out through the whole taste unit at school, but also through what’s happening with his family and Safer. By the end, I could see how it played out in almost every subplot, and yet I didn’t feel beat over the head with it. Very well done. Have you read LIAR & SPY yet? Let me know what you thought. MMGM: KEEPER OF THE LOST CITIES with a giveaway! 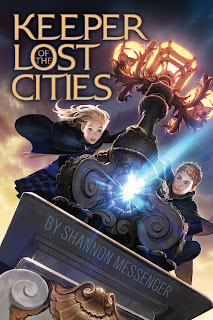 Like everyone else who participates in MMGM, I anxiously awaited the release of MMGM founder Shannon Messenger’s debut novel, KEEPER OF THE LOST CITIES. I’m thrilled to say that it met all of my expectations and then some. And because I want to give back to Shannon the way she gives back to all of us through MMGM, regular giveaways, and WriteOnCon, I’m going to do my first giveaway ever this week. The details are at the bottom of this post, so read on! Twelve-year-old Sophie Foster has a secret. She’s a Telepath–someone who hears the thoughts of everyone around her. It’s a talent she’s never known how to explain. Everything changes the day she meets Fitz, a mysterious boy who appears out of nowhere and also reads minds. She discovers there’s somewhere she does belong, and that staying with her family will put her in grave danger. In the blink of an eye, Sophie is forced to leave behind everything and start a new life in a place that is vastly different from anything she has ever known. Sophie has new rules to learn and new skills to master, and not everyone is thrilled that she has come “home.” There are secrets buried deep in Sophie’s memory–secrets about who she really is and why she was hidden among humans–that other people desperately want. Would even kill for. 1. The descriptions – I’ve said before that I’m a sucker for a good metaphor or simile, and Shannon Messenger is a master of description. I’ve pulled one example that stood out enough I stopped reading to go insert it into this post so I wouldn’t have to search for it later. It’s the kitten thing. I just loved it. 2. Sophie’s strength – I really admired Sophie as a character. Sophie deals with some real temptation thanks to her telepathic ability, and while she doesn’t always succeed, she makes it right when she doesn’t. She stays strong in resisting temptation, even when it’s really hard, and that made her character in my book. Here’s an example, although I’ve omitted one word to avoid a spoiler. “Alden closed his eyes. Listening to Grady’s thoughts? Transmitting another plea? Not since the xxxxx incident had Sophie been so tempted to violate the ethics of telepathy and find out what was going on. But if Alden somehow caught her, Bronte could use it to have her exiled. She could probably sneak in without him knowing, but what would she do with the information? If she said or did anything about it, he’d know how she found out. 3. The layers – Sophie’s been thrown into an entirely new world, so there are many things for her to figure out. Fitting into a new school. Making friends. Worrying about the fires in the human world. Figuring out where she came from and why she’s so different. And if that isn’t enough, she can’t even trust her own mind. I enjoyed the way Shannon Messenger brought these layers together in the end without resolving everything. It left me satisfied for now but wanting more later. 4. Keefe – If this is going to be one of those series where you pick a team, then I’m definitely Team Keefe. Just thought I should put that out there now. I know she likes Fitz, but there’s something to be said for the boy who keeps her off-balance and believes in her through everything. Even her best friend Dex doesn’t live up to that standard at one point. Plus, Keefe has some family issues going on that I bet are going to come up in one of the future books. It should make things quite interesting. Note: In case this point makes you wonder if the book is more YA, that’s not the case at all. We’re talking about first crushes and tingly feelings and blushing, nothing more. 5. It made me tear up – As my husband would tell anyone, it takes a lot to make me cry. I rarely do it in real life, but sometimes a book or movie will really get to me. There was a scene with Sophie’s host family that made me tear up, and for me, that takes this book to the next level. I have to really identify with the character for that to happen, and Sophie earned the tears. She may be special, but her life isn’t perfect by any means. She has to figure out how to live with her new reality, and I expect there will be more emotional trials to come in the rest of the series. So, the contest! I’m giving away a signed copy of KEEPER OF THE LOST CITIES*. To enter, leave a comment on this post by noon Central Time this Friday, Nov. 2. I’ll announce the winner on next week’s MMGM post. For querying writers, Shannon Messenger is represented by Laura Rennert at Andrea Brown Literary Agency. *I’ve had a few questions about whether the contest is international. I hadn’t considered that, so here’s what we’ll do. I’m going to have the book shipped directly from the store where Shannon signed. If the winner is in another country and this shop doesn’t ship internationally, we may have to work something else out (like an unsigned copy from a store in your country if available), but I’m not going to exclude anyone.